Community members and garrison leaders honored long-time garrison employees at an employee length of service ceremony here. 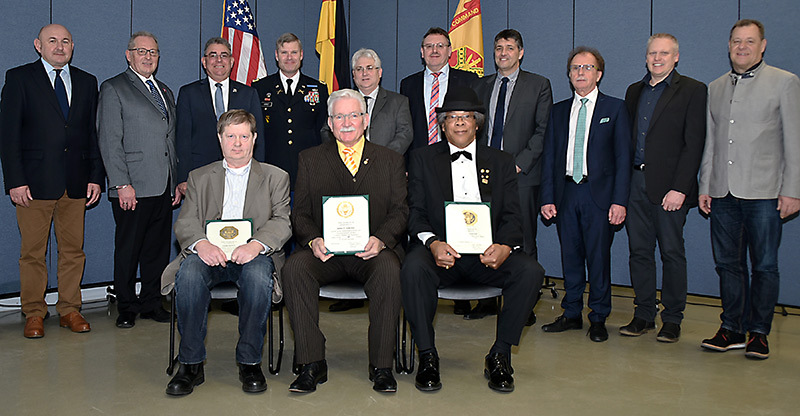 GRAFENWOEHR, Germany – Community members and garrison leaders honored long-time garrison employees at an Employee Length of Service ceremony here March 14. In total, these garrison employees have logged 1,064 years of total service to the U.S. Army and federal government. Col. Lance Varney, commander of the U.S. Army Garrison Bavaria, in his remarks highlighted the importance of the civilian workforce in supporting the Soldiers’ missions, and what they have done in the past and will do in the future. “’The quality of a person’s life is in direct proportion to their commitment to excellence, regardless of their chosen field of endeavor’, said Vince Lombardi,” Varney said. James Federline celebrated 49 years of service and retired this year. Mr. Beitz and Mr. Turner celebrating their 45th anniversary of service. In addition to the civilian awards, Varney presented a safety award, a team award and the civilian of the quarter award. To view the photos of individual awardees, visit our “Length of Service 2018” Flicker set.